Although laying a loved one to rest is a sad time for family and friends, we like to think we can provide a special and poignant sendoff. You can be assured of our utmost respect and professionalism throughout and, whether you have specific requests or would like us to choose something traditional and befitting, we will meet your requirements. We will do our best to accommodate any special requests, no matter how strange they may seem. 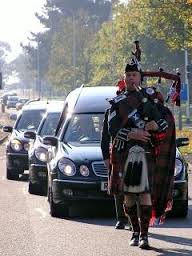 Some songs actually come across really well on the bagpipes, so please let us know if we can incorporate a favourite song or artist in order to honour your loved one's last wishes. We'd be honoured to set an appropriate and respectful musical background to proceedings, whether by a graveside or at a crematorium. If you'd like us to be involved in the wake too, it would be an honour. Just let us know and we'll talk you through the options available.